Not sure about a word you’ve come across in our site. Find the definition here. Business entities in Nevada must file lists annually with the Secretary of State specifying the names and addresses of the persons or entities in control of the affairs of the business. Corporations are required to list the President, Secretary and Treasurer and at least one director. Limited Liability Companies list the Member(s) and/or Manager(s). Limited Partnerships list the General Partner(s). Business Trusts list the Trustees. Nearly all states require a corporation to hold an annual meeting of shareholders, at which time directors is elected and other corporate issues are voted on. Officers and directors are determined at the annual meeting. (Certificate of incorporation or charter). The articles are the primary legal document of a corporation; they serve as a corporation’s constitution. The articles are filed with the state government to begin corporate existence. The articles contain basic information on the corporation as required by state law. Limited Liability Companies must file the articles with the proper state authorities to begin existence. The articles of organization are very similar to a corporation’s articles of incorporation. An authentication has the same purpose as an apostille. It is a document issued under the Great Seal of the State of Nevada by the Secretary of State and is attached to a certified copy of documents. Many foreign countries, other than Hague Treaty countries, require this document as validation of the authenticity of the certification. The authorized stock of a corporation is the total amount of stock that a corporation is authorized to issue and must be specified in the Articles of Incorporation. The authorized stock of a corporation may only be changed through the filing of an amendment to the articles of incorporation. State law requires that every person or entity doing business in the State of Nevada obtain a business license annually. A business that meets the criteria shall not do business in the state of Nevada without the State Business License. Certain businesses may be exempt from the state business license requirement. An entity provided for by the 1999 Nevada State Legislature. Bylaws are the rules and regulations adopted by a corporation for its internal governance. It usually contains provisions relating to shareholders, directors, officers and general corporate business. At the corporation’s initial meeting the bylaws are adopted. Bylaws are a private document not filed with any state authority. Bylaws are more flexible than the articles of incorporation because they are easier to amend. Bylaws are analogous to the Operating Agreements of LLCs and Partnership Agreements of LPs. A calendar year is designated by a business that begins January 1 and ends December 31. The termination of a Limited Partnership is accomplished by the filing of a Certificate of Cancellation with the Secretary of State or by failing to file the annual List of General Partners in a timely manner. Capital Gains or Losses are realized from the sale or exchange of Capital Assets. The amount is determined by calculating the difference between an asset’s purchase and sale price. A Certificate of Authority is a document issued by the Secretary of State to a foreign business entity granting the business the right to operate in that state. Also referred to as a Good Standing; a certificate issued by the Secretary of State bearing the Great Seal of Nevada indicating that the company is in a current and active status. A close corporation is a corporation that possesses the following traits: a small number of shareholders, not to exceed 30; no ready market for the corporation’s stock; and substantial participation by the majority shareholders in the management of the corporation. Nevada provides for Close Corporations in its statutes (NRS Chapter 78A). Common stock is the primary stock of a corporation. This stock gives shareholders the right to participate in the management of the corporation and gives the shareholder a proportionate share of the dividends. If corporate formalities are not followed, it is possible that the corporate entity will not protect shareholders from corporate debt. Keeping proper records and holding regular meetings avoid this problem. Maintaining proper records is very important to assure limited liability protection to corporate officers, directors and shareholders. The corporation should have a record book that contains a copy of the articles of incorporation, bylaws, initial and subsequent minutes of directors and shareholders meetings and a stock ledger. Fountainhead Associates is a company that specializes in the maintenance of corporate records. This method of voting is intended to create adequate representation of minority shareholders. Cumulative voting allows shareholders to aggregate their votes in favor of fewer candidates than there are slots available. The articles of incorporation may provide for the allowance of cumulative voting. When a company is doing business as or under a name that is not the legal name of the corporation as shown in its articles of incorporation different name, perhaps for a special project, it may file in the county the “DBA” (also known as “fictitious name” or “assumed name”). If a corporation does business under an assumed name, it may be required to file its fictitious name with the county or counties in which it is doing business in Nevada. This is useful if the company wishes to deposit funds into the company account that are payable to its DBA name. A distribution is money or property paid by an S corporation to a shareholder. The distributions are subject to taxation on the recipient’s return. The S corporation files a tax return but pays no federal income tax on its earnings itself. A dividend is a distribution of money or property paid by a C corporation to a shareholder. These distributions are subject to a double tax; both the corporation and the dividend recipient must pay federal taxes on these earnings. In the case of an S corporation the term used is “Distribution”. A business entity is domestic to the state where it has been formed. A business entity is domiciled in the state in which it is formed. Equity is the ownership of a shareholder in a corporation. A fiscal year is any twelve-month period designated by a business as its fiscal accounting period. A Federal Tax Identification Number is a number given to a business entity by the federal government for tax purposes. This number is identified with the state in which the application for it was made. Since Nevada and the IRS do not share financial information, it is advantageous for Nevada business entities to get Federal Tax Identification Numbers through the Ogden Regional Office. Banks generally require a tax identification number to open bank accounts. This number is sometimes referred to as an EIN or Employer’s Identification Number. A business is referred to as foreign in all states except for the state where it is formed. If an entity conducts business in a state other than where it was formed, it must register for a certificate of authority to transact business in the other state or possibly lose access to that state’s courts and may face fines. A franchise tax is a tax on the privilege of carrying on business levied by many states. The value of the franchise tax may be measured by amount of earnings, total value of capital or stock, or by amount of business done. Nevada has no franchise tax. A certificate showing the company is current with the State of Nevada. A Holding Company is a corporation that has no other function except owning other corporations. An incorporator is a person or entity that prepares and files the articles of incorporation. 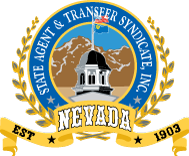 State Agent and Transfer Syndicate, Inc. acts as an incorporator for many new companies. To indemnify is to reimburse or compensate. Directors and officers of corporations are often reimbursed or indemnified for all the expenses they may have incurred during the incorporation process. A member’s ownership in an LLC is represented by “interests” just as a partner has an interest in a partnership and shareholders own stock in a corporation. A business entity formed upon filing articles of organization with the Secretary of State and paying all fees is a Limited Liability Company. LLCs are a relatively new entity in the United States, although the concept has long been used internationally. LLCs provide limited liability to their members, and can be taxed like a partnership, preventing double taxation. The alternative is filing as a C corporation. Double taxation then results. LLCs can now be formed in every state. Maintaining proper records is very important to assure limited liability protection to members and managers. The LLC should have a record book that contains a copy of the articles of organization, operating agreement, initial and subsequent minutes of meetings and a membership ledger. The provision states that directors of corporations will not be held personally liable for unwise business decisions providing that the directors made an informed decision and that decision was not tainted by self-interest. An LLC may be operated by a group of managers who act much like a board of directors. If an LLC is to be controlled by managers this fact must be stated in the articles of organization. Merger occurs when one entity is taken over by another. The merging documents specify the surviving entity. Minutes are the written record detailing the events of the corporation. These records should be kept in the corporation’s record book. The name of a corporation, an LLC, a Limited Partnership or a Business Trust must be distinguishable on the records of the state government. If the name is not unique, the state will reject the filing of the initiating document. The test for uniqueness does not include the entity designation (i.e., Inc., Corp., Ltd., LP, LLC or BT) as part of the name. A name can be reserved, for 90 days, by applying with the Secretary of State and paying a fee. State Agent and Transfer Syndicate, Inc. can arrange for name reservations. No-Par-Value Stock is stock with no minimum value. Most states allow no-par stock. If the stock is no-par stock then the amount of stated capital is an arbitrary amount assigned by the board of directors. The value of a share, for filing purposes, is determined as being $1.00 by the State of Nevada. This may result in higher filing fees in comparison with low par-value stock. A Not-For-Profit Corporation is a corporation organized for some charitable, civil or other social purpose that does not entail the generation of profits for shareholders. These corporations receive special tax treatment. Not-for-profit corporations must file not-for-profit articles of incorporation with the state. If a federal tax status such as 501 (c) 3 application is anticipated, consideration of special provisions should be explored before filing the articles of incorporation. Officers are people appointed by the directors to manage the daily affairs of the corporation. A corporation’s officers usually consist of a president, vice-president, treasurer, and secretary. In Nevada, one person can fill all of these roles. In Nevada, at least one director is required. The Operating Agreement is an agreement among the members of the LLC’s which govern the LLC’s operations and the rights of its members. It is analogous to corporate bylaws and general partnership agreements. The Organizational Meeting is the initial meeting where the formation of the business is completed. At the organizational meeting a number of initial tasks are completed such as the ratification of articles, the issuance of initial shares, officers are elected, bylaws (operating agreements, partnership agreements) are approved, and a resolution authorizing the opening of bank accounts is passed. In Nevada, the initial directors are named in the articles of incorporation. They will hold the organizational meeting. A few states require corporations to have a specified amount of paid in capital prior to starting business. These states include CT, DC, SD, and TX and require that the company have $1,000 in paid in capital before starting business. Nevada does not. Par value is the stated minimum value of a share of stock. Stock must be sold for at least this value or the owner of the stock can face liability. With low par value stock or no par value stock this liability is minimized. S corporations and Limited Partnerships are both pass-through taxation entities and LLCs can be. Income to the entity is not taxed. Instead the income is “passed through” to the individual shareholders or interest holders. Preemptive Rights are the rights delineated in the articles of incorporation granting shareholders the first opportunity to buy a new issue of stock in proportion to their current equity. The shareholder has the right to buy the new issue of stock, but is not required to make the purchase. If the shareholder elects not to exercise this right, the shares can be sold on the open market. Preferred Stock is stock that generally provides the shareholder with preferential payment of dividends but does not carry voting rights. A Professional Corporation is a corporation that is organized for the purpose of engaging in a learned profession such as law, medicine or architecture. Professional Corporations must file articles of incorporation with the Secretary of State which meet the state’s requirements for professional corporations. In Nevada each principal of the corporation named in the articles must be licensed by the qualifying professional board in Nevada. If a shareholder can not attend a meeting, the shareholder is allowed to vote by proxy unless prohibited in the bylaws. A proxy grants another individual the power to vote on their behalf. A quorum is the minimum attendance required to conduct business at a meeting. Usually, a quorum is achieved if a majority of directors are present (for directors meetings) or outstanding shares are represented (for shareholder meetings). The percentage needed for a quorum may be modified in the bylaws. The Registered Agent is the agent named in the filed documents creating the entity. The Registered Agent’s principal function is to receive service of process on the entity and other important documents. The agent must be named in the articles of incorporation. The Registered Agent can only be changed through the filing of a Certificate of Change of Registered Agent signed by an officer and accepted by the new Registered Agent. The registered office is the office named in the articles of incorporation. The registered office must be where the resident agent is located, and need not be the principal office or place of business of the corporation. A revoked corporation may be reinstated to Current Status (see Status) with the Secretary of State by paying all back filing fees, back penalties and a reinstatement fee within five years of being revoked. After five years the entity is permanently revoked and must be revived (see Revival) in order to conduct business. A permanently revoked entity may regain Current Status by paying all back filing fees, back penalties, a reinstatement fee plus refiling its articles. A search of state records to establish dates of origin and file number may incur fees. A Subchapter S Corporation or S Corporation is a small corporation that elects subchapter S tax treatment. This tax treatment allows the corporation to avoid federal level taxation. The application for such election is designated as an IRS form 2553. A share represents an interest in a corporation. The total ownership of a corporation is divided into shares of stock. A shareholder is any holder of one or more shares in a corporation. Shareholders usually have evidence that they are shareholders, represented by a stock certificate. A sole proprietorship is a business carried on by the owner as an individual. The owner of a sole proprietorship is personally liable (via their social security number) for all of the debts of a business; thus, personal property could be taken to pay business debts. The stated capital is the par value of shares multiplied by the number of shares outstanding. The amount of stated capital could affect the ability to pay dividends. The status of a business entity is determined by the currency of documents filed with the Secretary of State. Current Status indicates that the business has filed its initial or annual list. Default Status indicates that the business has not filed its list prior to the first day of the month following the anniversary month and a late penalty is applied. The company may remain in Default for nine months at which time its status is designated as Revoked. An additional penalty is applied to the filing fee to restore the company to Current Status. A company that has been revoked for five years becomes Permanently Revoked. Stock is equity or ownership interest in a corporation, measured in shares. Ownership of shares is demonstrated by stock certificates. Stock Certificates are written instruments that show ownership of shares in a corporation. The Stock Ledger is a record book that lists the owners of shares of stock in a corporation. It is also known as the Stock Transfer Book or Stock Register. Treasury shares are shares of stock that were issued and later reacquired by the corporation. Nearly all states allow directors to act without a meeting if they each give their consent to specific corporate actions in writing. The Uniform Commercial Code is a model statute covering things such as the sale of goods, credit, bank transactions, conduct of business, warranties, negotiable instruments, loans secured by personal property and other commercial matters. All states have adopted and adapted the entire UCC, with the exception of Louisiana, which only adopted parts of it. Filing a UCC Financing Statement puts the public on notice there is a lien on some type of collateral.